"The War on Christmas is over, and likes of Winterval, Winter Lights and Luminous deserve to be in the dustbin of history." Mr Pickles explained that the Christian festival has previously been ambushed by those intent on re-branding Christmas as a bland 'Winter festival', insisting that multi-cultural Britain can enjoy Christmas without abandoning its underlying Christian heritage in a misguided attempt to appease these politically correct 'Grinches'. Ah, Winterval. Not even December and it's time for Winterval stories. Although Paul Dacre has claimed that the Mail never does churnalism, 'Daily Mail Reporter' quickly bashed out a story, which involved copying-and-pasting all the quotes from Pickles. Winterval was, of course, 'ditched' in 1998-9 - which was the second and last time Birmingham council used it. A clutch of councils have cancelled Christmas and replaced it with multicultural holidays in a bid to be right-on. Changes have included banning carols and even rebranding the celebrations “Winterval”. Speaking to a packed Westminster Hall in London, he urged people to turn their backs on the use of words like “Winterval” to describe the festival of Jesus’s birth. Once again, she didn't name any person who had done this. That's 'annual' in the sense that it happened in 1997-8 and 1998-9 but not before or since. But Pickles' statement was 'urging', not 'ordering' (albeit 'urging' councils to stop using some terms that haven't been used for over a decade anyway). said the politically correct days of calling December 25 a "Winter Festival" must end. That's not quite what he had said (he made no reference to Christmas Day) - and Hartley doesn't mention which council has renamed Christmas Day 'Winter Festival'. The tone of the coverage, and the majority of the comments that have followed each article, are in praise of Pickles. The 'War on Christmas' myth lives on. It's depressing. No-one's trying to ban Christmas, for fear of offending minorities, or anything like that. Must we go through this every single year? Oh, we must. 'Christmas is banned' is as much of a Christmas tradition as granny falling asleep in front of Where Eagles Dare after scoffing the Milk Tray, it seems. On 2 July 2008 we published an article entitled "Just look what came crawling out" which alleged that at a protest at the celebration in London of the 60th anniversary of the founding of the state of Israel, Mohammad Sawalha had referred to Jews in Britain as "evil/noxious". We now accept that Mr Sawalha made no such anti-Semitic statement and that the article was based on a mistranslation elsewhere of an earlier report. We and Melanie Phillips apologise for the error. On 2 July 2008, the Spectator website published an article by Melanie Phillips entitled "Just Look What Came Crawling Out" ("the Article"). The Article falsely stated that Mohammad Sawalha had referred to Jews in Britain as "evil/noxious". Mohammad Sawalha has worked hard to build strong relations between communities of different faiths and no faith both in Britain and internationally, and was therefore shocked and outraged to read such a false and offensive accusation. It was immediately pointed out to the Spectator and Ms Phillips that this was a mistranslation of a transcript of an interview, which contained a typographical error, rendering the relevant phrase meaningless. It was also pointed out that the publisher of the original transcript of the interview had corrected the quotation already, making clear that Mr Sawalha had made no such anti-Semitic comment. Rather than carrying out the reasonable and obvious course of action of amending the Article, Melanie Phillips instead chose to go on and publish a further article, entitled "Taking the Airbrush to Evil", repeating the highly insulting false allegation made in the Article and casting doubt on the suggestion that there had been a typographical error. As neither the Spectator nor Ms Phillips agreed to deal with the matter amicably, despite requests by Mr Sawalha to do so, Mr Sawalha had no option but to seek vindication from the High Court. An independent expert, jointly commissioned by Mr Sawalha, the Spectator and Ms Phillips, confirmed that the phrase in the original transcript of Mr Sawalha's interview was meaningless and that it could not be translated as referring to Jews as "evil/noxious". Nonetheless, the Spectator and Ms Phillips continued to defend Mr Sawalha's claim. So Phillips repeated an accusation made elsewhere (by Al Jazeera and Harry's Place) without checking it out for herself. Al Jazeera corrected it instantly, and Harry's Place later, yet [Phillips] magisterially ignored requests for a simple correction until a trial was imminent, when she caved. There's also a question over the placement of the apology on the Spectator's website. It hasn't been published on Phillips' blog, where the false claim was made - twice - or even on the homepage of the 'blogs' section. Instead, it's in Magazine>Essays. I understand The Spectator has recently settled with [Mohammed Sawalha] after publishing a blog on its website by my friend Melanie Phillips which he regarded as libellous, and has again incurred costs said to run into hundreds of thousands of pounds. On 26 November , in referring to a magazine's claim that Cherie Blair had attended a shooting party which included Saif Gaddafi, we suggested this was hypocritical and had outraged the families of victims of the Lockerbie bombing. We accept that Mrs Blair did not attend the shooting party and has never met Mr Gaddafi. We apologise for any embarrassment caused. Associated Newspapers failed to provide a full and unequivocal apology, or even to give a substantive response to her complaint, [Blair] added. It's not the first time the Mail has been accused of dragging its feet over a complaint. And it's not the first time a newspaper apology has tried to shift blame to someone else. We were only 'referring to a magazine's claim' - don't blame us that we didn't check if it was correct before publishing it. In our article “And here’s the latest...it’s all over for Wright” on 13 August 2010, inaccurate information was published about Ian Wright. We accept that Mr Wright did not “storm out” of 'Live from Studio 5' and that he was asked not to attend the television studio after it was decided that his contract would not be renewed. We apologise to Mr Wright for any distress or inconvenience which may have been caused by this article. Given that the Express' [and Star's] owner, Richard Desmond, recently also became the owner of Channel 5, would I be the only one in thinking that this "error" might not have been an accident? On 21 July 2010 we published an article about terrorism in the UK which included photographs of eight men with the caption: "Liquid bomb plot – 2006". We wish to make it clear that one of those pictured, Donald Stewart-Whyte, right, was acquitted of all terrorism-related charges. We apologise for any distress caused by the inclusion of his photograph in this context. Last month, the Mail reported that a cafe in Stockport will have to remove its extractor fan 'because the smell of...frying bacon 'offends' Muslims'. The fan has to be removed because the cafe owners (one of whom is Muslim) were refused planning permission for it. Moreover, the only person who officially complained about the smell during the planning application process was a member of the non-Muslim family who lived next door to the cafe. readers would not be misled as to the circumstances surrounding the refusal for planning permission. The Commission made clear that, given the brief and limited nature of headlines, it considers them in the context of the article as a whole rather than as stand alone statements. In this instance, the Commission noted that the headlines reflected Mr Webb-Lee’s testimony that his Muslim friends would not visit because of the smell of bacon that came from the fan. While it acknowledged the complainants’ argument that this was not the specific reason given by the council for the refusal of the application, it noted that this was indeed an aspect of Mr Webb-Lee’s complaint which had led to the refusal of retrospective planning permission. The Commission was satisfied that the body of the articles in the Daily Telegraph and the Daily Mail made clear the situation and that, when the headline was read in conjunction with the article, readers would not be misled as to the circumstances surrounding the refusal for planning permission. In regard to the Metro’s article, the Commission acknowledged that it had not included specific details of Mr Webb-Lee’s complaint. However, given that his complaint had referred to his Muslim friends’ refusal to visit his house on account of the smell given off by the extractor fan, the Commission was satisfied that the sub-headline “A café boss has been ordered to change her extractor fan because the smell of frying bacon offends Muslims next door” was reflective of this complaint. The body of the article also made clear that the council’s decision was based on the smell being “unacceptable on the grounds of residential amenity”. While it considered that the newspaper could have included further details about the complaint, it did not, on balance, consider that the absence of such details were misleading in such a way as to warrant correction under the terms of the Code. It could not, therefore, establish a breach of Clause 1 (Accuracy) of the Code. Under the terms of Clause 12 (Discrimination) newspapers must avoid making prejudicial or pejorative reference to an individual’s religion. However, the clause does not cover generalised remarks about groups of people. Given that the complainants considered the article to discriminate against Muslim people in general, the Commission could not establish a breach of Clause 12 of the Editors’ Code of Practice. The articles were clearly prejudicial because the headlines and intros were misleading. The end result was to feed anti-Muslim bigotry. To build a story based on one man's unsupported statement when it involves the delicate matter of religious intolerance shows a reckless disregard for the pubic interest and social cohesion. In the PCC's opinion, "the body of the articles" in the Mail and Telegraph made the situation "clear." Come off it! 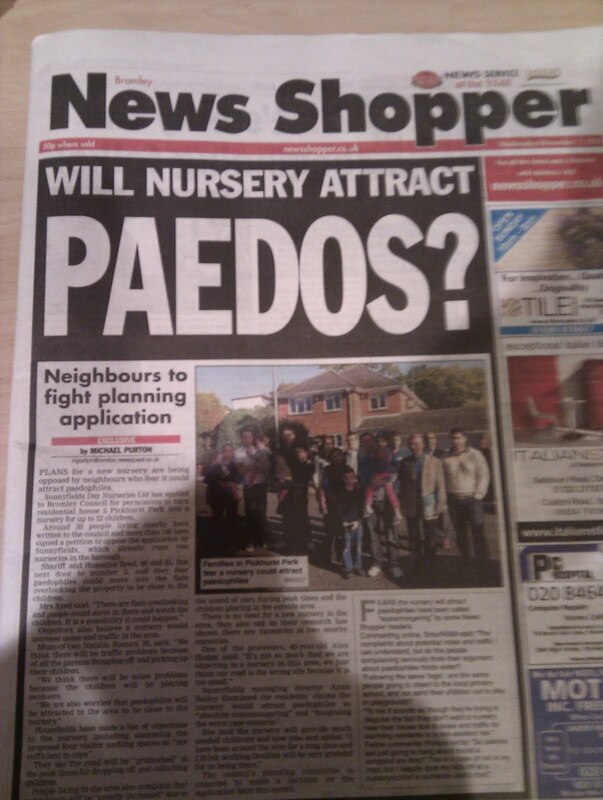 The papers did not run this story because it involved the removal of an extractor fan. They ran it because it fitted their own anti-Muslim agendas. On 24 May 2010 we published an article headed “Sophie Dahl: I’m no weight watcher” containing personal comments that we said had been taken from Sophie Dahl’s twitter page. We now accept that Sophie Dahl does not have an active twitter page and the comments were invented by hoaxers. The page has now been removed from circulation. We are happy to make this clear and apologise to Sophie Dahl for any distress and embarrassment our article has caused. ...the Commission was particularly concerned at the lack of care the newspaper had taken in its presentation of the story. One common criticism of the PCC is that it has no power to fine newspapers for serious or repeated breaches of the Code of Conduct, but Gore says that this “massively underestimates” the impact of the PCC’s adjudications on newspapers and editors. Because we would hate to 'massively underestimate' the power of the PCC, we must assume that the Star has been ever-so careful to make sure the same 'lack of care' has not been present in other front page stories since that adjudication. Well, they didn't do very well with the 'Chile mine to open as theme park' one. Or with the two 'reality TV' headlines on the same day which weren't exactly true either. And then there was the 22 October one about someone being 'out of X Factor' despite, at time of writing, that person still being 'in' X Factor. To read the full story, buy new! magazine out now. But the 'full story' - if it can even be called that - is already in the Star. Is reality TV 'star' Amy Childs really Peter Andre's 'new love', as claimed on the front page and in Gemma Wheatley's article? I do know that Amy is only 20 years old and therefore a little bit young for me! I’m very flattered but I think dating someone 17 years younger than me might be a bit weird. So if she isn't his 'new love', how can Jordan be in a 'fury' about it? According to this tweet, she isn't. It appears, then, that none of the Star's front page headline is accurate. Again. On Friday, a press release from Southampton University Hospitals NHS Trust reported on research from consultant orthopaedic surgeon Professor Nicholas Clarke and Dr Justin Davies, a consultant paediatric endocrinologist. After checking over 200 children in Southampton for bone problems, Clarke and Davies found that more than one-fifth showed signs of rickets. Both pieces...contain exactly the same information and quotes. Could it be that the first story has been hastily edited and re-printed in a desperate attempt to mould it to The Sun's anti-games news agenda? We're not cynical enough to suggest so. It's just... aside from its screaming headline, the second story only mentions video games once, in its opening paragraph. The rest is pretty much a carbon copy of the original report. Even The Sun's own doctor, Carol Cooper, doesn't mention games in her analysis. Nor indeed does the Mail, which always likes to blame video games for something. "...a completely new occurrence that has evolved over the last 12 to 24 months." ...the disease is now making a comeback around the world due to low vitamin D levels caused predominantly by lack of exposure to sunlight and also poor diet. It also says absolutely nothing about whether 'game addict kids' are more likely to suffer with rickets. "We do not say that gaming causes rickets." "The average age of a child with rickets is around 20 months old: too young to use a keyboard and mouse!" As Primly Stable pointed out, this followed previous Mail articles - including one from August - that taking aspirin during pregnancy could 'prevent pre-eclampsia'. But it could also double the risk of miscarriage. Current advice states that pregnant women should avoid ibuprofen and aspirin during pregnancy, although there is no evidence that occasional use of paracetamol is harmful. The results of this study are unlikely to change those recommendations, but women should seek advice from their GP or midwife before taken any medications during their pregnancy. And they should not seek guidance from stories in the media. Yet articles about miracle cures or health scares have become a staple. Conflicting advice about the dangers or benefits of aspirin, for example, are common, as is poor reporting about medicine, science and research. Recently, Angry Mob published a post on the 'unacceptable' way a recent study on CPR was reported, particularly by the Mail. A taste for celery is one that many people never acquire, but scientists have just given them a reason to eat it. They have discovered that a chemical found in high concentrations in celery – and in peppers – could halt memory loss as we get older. The U.S. researchers say the plant compound luteolin reduces inflammation in the brain, which is associated with ageing and its related memory problems, by halting the release of molecules that cause the inflammation. Only after that does the Mail explain the research was conducted on mice. Although this is interesting basic research that may give insight into at least one of the processes involved as the brain ages, its direct relevance to humans is limited. The mice were given a relatively high supplement of pure luteolin. There is not sufficient evidence to suggest that normal dietary consumption of luteolin–rich vegetables such as celery can improve memory in humans. The Daily Mail’s report has exaggerated the relevance of this study to humans and the effect that eating celery might have on human memory. Meanwhile, on 13 October, the Express ran the front page headline 'Drug to stop memory loss'. An anti-ageing drug for the brain has come a step closer after an amazing breakthrough by a British team of researchers. 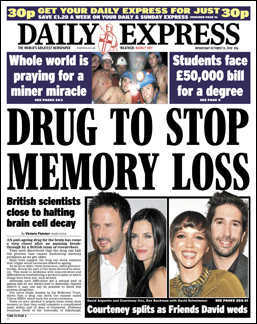 They have discovered that the drug can halt the process that causes frustrating memory problems as we get older. Early tests suggest the drug can block enzymes that trigger stress hormones linked to ageing. Once again, it was only several paragraphs into the article that it was revelaed the tests had only been done on mice. The newspapers have over-interpreted the relevance of these findings to humans. A few days before that, both the Express and Mail reported on the latest research about the benefits of tea. Tea, a heart protector: three cups a day can prevent cardiac problems, say experts, claimed the Mail. Two cups of tea a day 'cuts heart disease' said the more optimistic Express. The review was reported in both the Daily Mail and Daily Express, whose reporting generally did not reflect the uncertainty of the study’s conclusions. For example, the Mail reported that three cups of tea a day can prevent cardiac problems, while the Express said drinking tea two or three times a day could reduce risk of the disease by 11%. These claims appear to be based on a 2001 analysis, which the reviewers considered to be flawed. The review actually suggests that this earlier research had several problems that undermine the certainty of the results. Both newspapers also claim that drinking two cups of tea will provide as many antioxidants as eating five portions of vegetables. Although tea does contain antioxidants, the suggestion that it can be a substitute for the numerous health benefits of fruit and vegetables is not supported by this research. 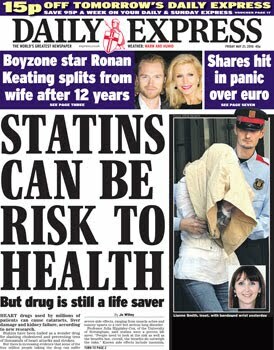 On 18 October, the Express was leading on the 'secret' to a long, healthy life. 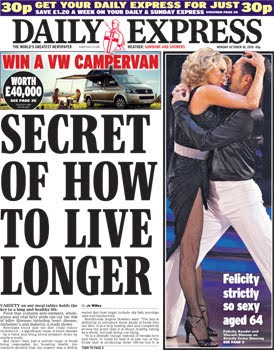 And what was this 'secret' that no-one could possibly have ever known about before the Express revealed it on their front page? ...research showed that the answer was a widely varied diet that might include oily fish, porridge oats and blueberries. Next they'll be saying that drinking moderately, not smoking, doing exercise, watching your weight and eating less red meat is good for you. New mothers often grumble that their brain has turned into mush. But having a baby may actually make you brighter, a study has found. A similar leap was taken by Fiona MacRae in the article 'Violent films, video games and TV shows DO make boys aggressive'. Watching violent video games, films and TV shows really can make children more aggressive, scientists believe. DOES this study say that? The small study looked at brain activity and automatic nervous response (skin sweating) in boys aged 14 to 17 years who were watching short video clips of low-to-moderate levels of aggressive behaviour. The researchers found that sweating and brain response to moderate aggression reduced over time, but response to milder scenes did not change as much. Despite what has been implied by the media, this study did not look at the boys’ behaviour. Crucially, although this study may suggest some short-term changes in the brain activity of teenage boys watching aggressive material, it cannot tell us if it would actually influence their actions. A daily glass of beetroot juice could combat the onset of dementia among older adults. 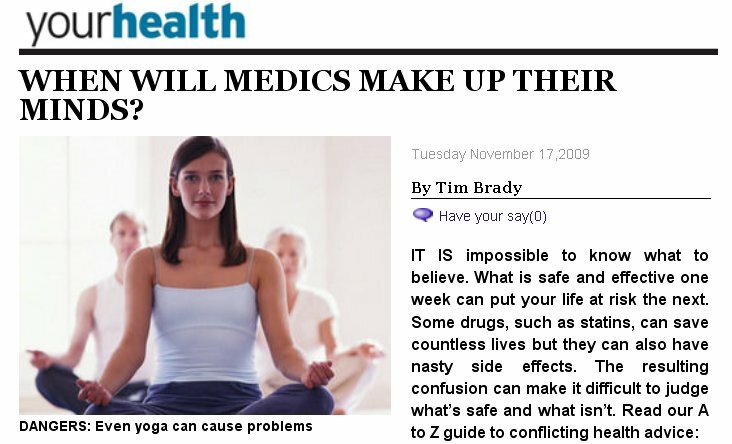 This news story is a based on a small study in 16 elderly people...conducted over an extremely short time span. Its findings suggest that adults who eat a diet high in nitrates may experience an increased blood flow to certain areas of the brain within a short interval, compared with eating a diet low in nitrates. The researchers only measured blood flow in parts of the brain and did not measure the participants’ cognitive abilities. As such, it is not known whether a high nitrate diet does benefit people in this way. What about the Mail's 'Strict diet two days a week 'cuts risk of breast cancer by 40 per cent'' which was highlighted in Ben Goldacre's recent article about the 'Daily Mail cancer story that torpedoes itself in paragraph 19'? ...the way this study has been promoted, and subsequently reported, has been been misleading and inaccurate. In short, this was a study about dieting and weight loss, and not about breast cancer at all. And it can’t be used to conclude anything about breast cancer risk, nor about how women should or shouldn’t diet. Cancer Research UK have also been at the forefront in challenging claims about cancer being a new, man-made disease. assertions have dismayed cancer researchers, and have led to a rash of uncritical coverage. Such as in the Mail, where Fiona MacRae, again, wrote 'Cancer 'is purely man-made' say scientists after finding almost no trace of disease in Egyptian mummies'. ...it was not until the 17th century that they found descriptions of operations for breast and other cancers and the first reports in scientific literature of distinctive tumours have only occurred in the past 200 years, such as scrotal cancer in chimney sweeps in 1775, nasal cancer in snuff users in 1761 and Hodgkin’s disease in 1832. The 17th century provides the first descriptions of operations for breast and other cancers. And the first reports in scientific literature of distinctive tumours only occurred in the past 200 years or so, including scrotal cancer in chimney sweeps in 1775 and nasal cancer in snuff users in 1761. We were concerned to see headlines in the media today claiming that scientists say cancer is ‘purely man-made’. This is not only scientifically incorrect, but misleading to the public and cancer patients. Our lifestyles have a great impact on our chances of developing cancer – as we’ve said many times. But the evidence that’s being used to justify these latest headlines doesn’t in any way support the assertion that cancer is modern or man-made. A quote from [Rosalie] David put out by the University of Manchester saying "There is nothing in the natural environment that can cause cancer. So it has to be a man-made disease, down to pollution and changes to our diet and lifestyle" caused particular consternation. There are dozens of natural causes of cancer, including ultraviolet light from the sun, natural radiation from radionuclides such as radon in rocks, and infection by viruses that trigger cancer, such as the human papilloma virus, which causes cervical cancer and hepatitis viruses that can cause liver cancer. Likewise, soot and smoke from fire contain a multitude of carcinogens, as do fungal aflatoxins deposited on peanuts. "And that's to say nothing of cancers caused by genetic inheritance," says Kat Arney of Cancer Research UK. Sadly, so much science reporting seems to be 'confusing and misleading' because eye-catching headlines take precedence over accuracy. During the live broadcast of Film 2010 this week, a member of the crew was heard swearing. It went out after 10:30pm and host Claudia Winkleman apologised soon after. But this happened on the BBC, so inevitably the Mail and the Sun thought they would report on the 'shock' this had caused. BBC1 viewers were left stunned last night when a foul-mouthed rant was accidentally broadcast during the live Film 2010 show. BBC1 viewers were left shocked last night when a four-letter-word rant was accidentally broadcast during Claudia Winkleman's live Film 2010 show. Embarrassed host Claudia Winkleman was describing Jamie Lee Curtis's new rom-com You Again as "contrived and awful" when the four-letter outburst was heard over the top. Claudia, who also hosts Strictly Come Dancing's live results show, as well as spin off It Takes Two, had just described Jamie Lee Curtis's new rom-com You Again as 'contrived and awful' when the outburst was suddenly heard over the top. A woman - thought to be backstage in the studio - was heard saying: "... are you scared of his fans? And I'm like, No! I couldn't give a f*** about a load of... "
Winkleman, 38, apologised after the technical blunder. A woman with a Geordie accent - thought to be backstage - was heard saying: "...Oh, are you scared of his fans? And it's like, No! I couldn't give a f*** about a load of... "
Winkleman, 38, who co-hosts the show with film critic Danny Leigh, apologised after the technical blunder. It's hard to work out exactly how someone saying one f-word makes it a 'foul-mouthed rant'. And were viewers really left shocked and stunned? Neither article quotes a single messageboard comment from an angry viewer. Even the couple of mentions of the incident on the BBC Points of View messageboards, a favourite source for Mail hacks, contain very little 'shock'. The forecaster dispensed of the usual smart suit, shirt and tie for the more casual look of a dark blue V-neck jumper and blue jeans during the broadcast on BBC1. This was from 'Weather for the Week Ahead' during 'Country Tracks' yesterday. Weather presenters always dress down for it as it's not a news programme and the main presenters of the programme are normally in jeans and wellies themselves as they march around the countryside. It's not as if he presented the weather on the 10 o'clock news in a T-shirt. So a complete fuss about something that happens every week on the same show (indeed, one person at Digital Spy noted Schafernaker's casual dress for the Country Tracks programme on 24 October). It's hard to believe that the Mail didn't know that this wasn't a main weather bulletin, even though they imply it was. But if they had revealed that fact, the thinness of the story would have been even more evident than it already is. Viewer Stephen Jones, 35, from Bournemouth, Dorset, said he was stunned by the weatherman's casual appearance yesterday. He said: 'I thought I had tuned into Newsround or Blue Peter for a minute when I saw the main presenter wearing jeans and a jumper. 'I've heard of having dress-down days before but I didn't think the BBC went in for that. 'When you are presenting to the nation, especially on the BBC, surely you should look as professional as possible, not like someone who's just come in from off the street. It's hard to imagine how anyone could feel that offended by this. Not for the first time, the Mail website is taking time to point out that - shock - famous people get older too. So the Mail have got their hands on a pap shot of Erika Eleniak eating lunch and think it's worth pointing out she doesn't look quite like she did when made-up for a TV show over twenty years ago. But Daily Mail Reporter hasn't even got the simple facts right in this non-story. There are two mistakes in the first two sentences. If Eleniak was first in Baywatch in 1989, that's longer than 'just over ten years' ago. Moreover, she wasn't in the show until 2002 as they claim - she left in 1992. Since Daily Mail Reporter used IMDB to find out some other details of her career, they should have noticed that as well. 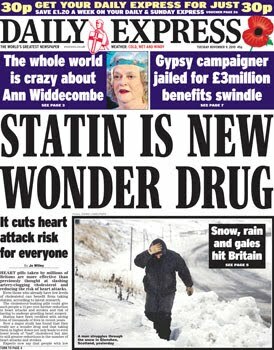 Statins have been around for years so it's not clear what is 'new' about them. A wonder drug that can be a risk to health? Apparently so. 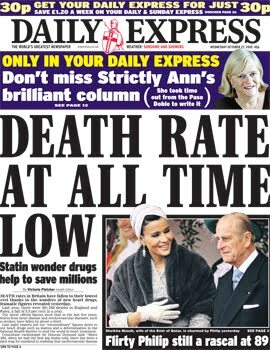 Indeed, the Express' coverage of statins has fluctuated between those two extremes for several years. They can cause 'cataracts, liver damage and kidney failure'? 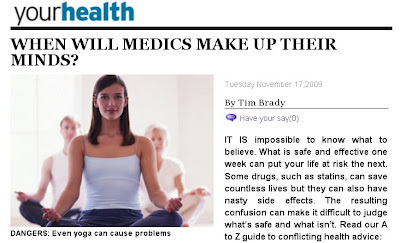 It may seem all very confusing that one newspaper can go from 'health scares' to 'miracle cures' about the same drug so often (they also do it with aspirin). The Express' coverage doesn't make it any easier. Minority Thought has done an excellent job in looking at today's overblown Express front page headline and story. The Express and its sister paper the Daily Star have tried to create a division between 'Muslims' and 'us' many times before. And the Express has form in trying to make the pronouncements of a few Muslims representative of the whole religion, too. And in this case, 'a few' is right. Despite the Express using emotive terms such as 'angry mob' and 'another demonstration raged outside' it appears only three people were involved and, apart from shouting, all they did was wave around some bits of A4 paper with homemade slogans printed out in black and red capital letters. By contrast, the demonstrations of the 'angry mob' called the English Defence League don't get mentioned on the front page of the Express. Their demos are bigger, involve people who hide their identity and usually end with people being arrested. Apparently, the Express isn't so concerned about that. Mor, indeed, is the Daily Star, which has often taken a quite uncritical line on the EDL, under headlines such as 'Case for the Defence'. Recently, the Star's coverage of the EDL's plans to march in towns that ban Christmas (yes, really...) was praised by one EDL-supporting blogger. That there are Muslim extremists who say such things is beyond a doubt. 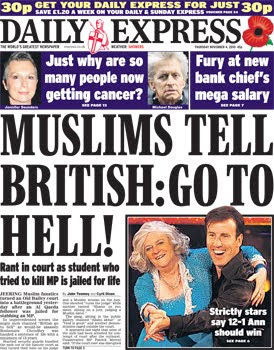 However, the Express' decision to make this the key focus of the story, along with the language used in the headline, is an attempt to imply that these shouts are in some way an expression of what every Muslims thinks about the British. * Minority Thought has also taken the Express to task recently over another 'health and safety bans...' myth. The Express claimed that a ten-year-old swimmer had been 'banned from wearing googles because of health and safety'. Usually these health and safety stories are about people being forced to wear goggles. But this one isn't true either - the advice (not ban) is that kids who swim should get used to eye contact with water. Health and safety had nothing to do with it.